XVI Karmapa (1924 -1981) was born in Derge province in Eastern Tibet. The previous Karmapa Khakhyab Dorje (1871-1922) left a letter setting forth the circumstances of his next incarnation. On the basis of this letter the authorities of the Tsurphu monastery were able to successfully locate the child. In 1931 the young incarnate was ordained as a novice monk and offered the Karmapa’s ceremonial robes and the Black Hat. Karmapa studied in Tsurphu monastery for four years, deepening his meditative realization of Sutra, Tantra, Mahamudra, and the “Six Yogas of Naropa”. As a boy he displayed an extraordinary natural insight and often told his teachers about his previous incarnations. At the age of 23 Karmapa received his final ordination, along with the initiations and explanations of the highest Karma Kagyu teachings. In 1959, due to the occupation of Tibet, Karmapa decided to flee his country, realizing that the cause of the Dharma would be served best by escaping the ever-tightening grip of Communist China. Accordingly, accompanied by an entourage of 160 lamas, monks and laymen, Karmapa left Tsurphu monastery, the traditional seat of the Karmapas, and proceeded towards Bhutan. Under Karmapa’s guidance the party was able to take along the most precious statues, ritual items, relics, thangkas and books, which had been preserved at Tsurphu monastery over the centuries. The ruler of the state of Sikkim in North-Western India offered the Gyalwa Karmapa Rumtek monastery, which was built during the time of Karmapa’s 9th incarnation, Wangchuk Dorje (1556 -1603). Karmapa undertook the construction of a new monastery in Rumtek, which due to the generous help of the Indian government and the ruler of Sikkim, was completed in four years. The new monastery in Rumtek became Karmapa’s official seat outside Tibet and a center of Buddhist study, ritual, and practice. In 1974 the 16th Karmapa led a party of Karma Kagyu lamas to the West, visiting Europe, America and Canada, and for the first time people in the West had the chance to participate in the Black Hat ceremony, which Karmapa performed on a number of occasions. Invited by his first Western disciples Ole and Hannah Nydahl, Karmapa arrived in Copenhagen, Denmark in December 1974. In November of 1976, Karmapa arrived in New York for a tour through the USA, and in the following year he spent six months on tour in Europe during which he visited Sweden, Denmark, Germany, Holland, France, and the United Kingdom. In May of 1980, Karmapa again visited the West, stopping for lectures and ceremonies in London, New York, San Francisco, and Boulder, Colorado. H.H. the 16th Gyalwa Karmapa died on November 5th 1981 in a hospital near Chicago. 17th Gyalwa Karmapa Trinley Thaye Dorje was born in Tibet on May 6th 1983. He was the first son of the 3rd Mipam Rinpoche, a great Nyingma Lama, and Dechen Wangmo, the daughter of a noble family descending from King Gesar of Ling. At the age of one and a half the boy started telling people that he was the Karmapa. In 1994, he and his family managed to escape from Tibet to Nepal and then to India. The young Karmapa arrived in New Delhi in March of the same year, where during a welcoming ceremony H.H. 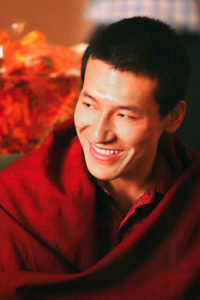 Shamar Rinpoche formally recognized him as the 17th Gyalwa Karmapa. The 17th Karmapa was given the name of Trinlay (meaning Buddha activity) Thaye (limitless) Dorje (unchanging). In 1997, H.H. the 17th Karmapa Trinley Thaye Dorje was officially invited to Bhutan for the cremation ceremony of Topga Rinpoche where he was received with full honors. A three-hour drive from the Bhutanese border to the capital Thimpu took seven hours as thousands of well-wishers greeted him along the road. On October 17th 1997, three thousand people came for his blessing and the whole royal family including the king and four queens received him as the 17th Karmapa. In October 1999, the 17th Gyalwa Karmapa embarked on his first international teaching tour and gave initiations to several thousand people in Singapore and Taiwan. The beginning of the new millennium was marked by his first historic visit to the West. In Dusseldorf, Germany, Karmapa was enthusiastically received by 6,000 students from several hundred Diamond Way Buddhist centers from over 30 countries. In the summer of 2003, H.H. the 17th Karmapa conducted his first official program in the United States, giving a series of empowerments and teachings. On July 19th and 20th 2003, he gave the Karma Pakshi and Medicine Buddha empowerments in San Francisco, California. The event was hosted by the Diamond Way Buddhist Centers, USA. In December 2003, after completing his formal education, the 17th Karmapa was declared “Great Tantric Master” (skt. Vajracharya). The 17th Karmapa Thaye Dorje currently resides in Kalimpong, India, where he continues his spiritual training and Western education. On 11 June 2014 our beloved teacher, the 14th Kunzig Shamar Rinpoche Mipham Chokyi Lodro, passed away in his cherished environment of Renchen Ulm, Germany, in the presence of his close family members and some of his closest students. The sudden loss to the world in general, to Buddhism in particular, and especially to his students, is profound and far-reaching. 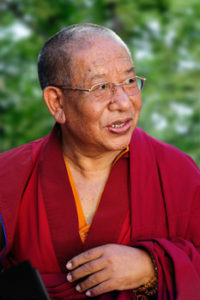 An emanation of Buddha Amithaba, Kunzig Shamar Rinpoche is second to Gyalwa Karmapa in the spiritual hierarchy of the Karma Kagyu School of Tibetan Buddhism. The first Shamar Rinpoche, Khedrup Trakpe Senge (1283-1349), was the principal disciple of the 3rd Karmapa, Rangjung Dorje. His second incarnation, Kacho Wangpo, received the Red Crown from the 4th Karmapa, Rolpe Dorje, an exact replica of Karmapa’s Black Crown. 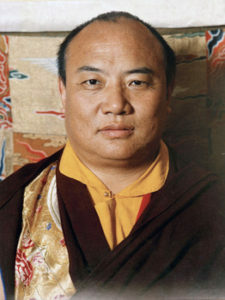 With the Red Crown, the Karmapa bestowed on him the name of “Shamarpa – The One with the Red Crown.” Since then, Karma Kagyu texts speak of two Karmapas, the Black Hat and Red Hat Karmapas, always alternating as teacher and student throughout centuries and their minds are considered inseparable. The 14th Kunzig Shamar Rinpoche Mipam Chokyi Lodro was born in 1952 in Derge, Tibet as the nephew of H.H. the 16th Karmapa. He was recognized as the Shamarpa incarnation at the age of 6, and was taken to Yang Chen Monastery, the main seat of the Shamarpas in Tibet. He left Tibet at the age of 9 together with the 16th Karmapa for Sikkim, India where he lived and studied under Karmapa’s guidance. Kunzig Shamar Rinpoche received the entire teachings and transmissions of the Karma KagyuSchool from the 16th Karmapa at Rumtek monastery in Sikkim. After Karmapa’s death, Shamar Rinpoche undertook the project of completing the Karmapa International Buddhist Institute (KIBI) in New Delhi, India. In March 1994, he officially recognized Trinley Thaye Dorje as the 17th Gyalwa Karmapa. 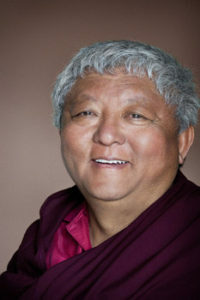 Shamar Rinpoche spends most of his time giving Dharma teachings around the world. 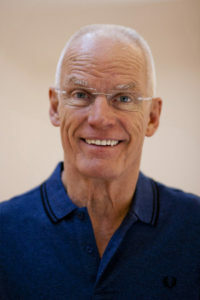 Lama Ole is the author of several books including The Way Things Are;Entering the Diamond Way; Mahamudra; Riding the Tiger (all from Blue Dolphin Publishing, USA); and The Great Seal (Fire Wheel Publishing, USA). Sherab Gyaltsen Rinpoche, a highly respected lama of the Kagyu lineage, is a “Maniwa’, a title given to masters of the Chenrezig practice who have accomplished at least a billion Om Mani Peme Hung mantras. Rinpoche was ordained in Rumtek by the 16th Karmapa, Rangjung Rigpe Dorje. An exceptionally gifted student, he mastered all aspects of traditional Buddhist study, from the sutras and tantras to rituals and music to the sciences, art and composition. Among his many activities, Rinpoche is a retreat master of the three-year retreat center in Pharping, he has built and oversees a monastery of a hundred nuns west of Kathmandu, and plans to build a monks’ monastery east of the capital are moving along. Several times a year Rinpoche leads thousands of practitioners in the practices of Nyung-ne and Chenrezig at his Nyeshang monastery in Swayambhu. Over fifteen billion Chenrezig mantras have been accumulated over the years. Rinpoche’s teaching style is deep, direct and accesible. His teachings, peppered with practical advice, stories and warm humor, leave a lasting impression on all who are fortunate enough to hear them. 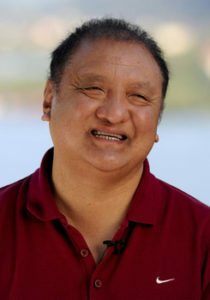 Lama Jigme Rinpoche was born into the family of H.H. the 16th Gyalwa Karmapa, as the brother of Kunzig Shamar Rinpoche. He received extensive teachings from the 16th Karmapa, who during his first visit in the West left him there as his representative. Since that time, Jigme Rinpoche has been guiding Karmapa’s seat in Europe, Dhagpo Kagyu Ling in France. Besides his organizational skills, he is highly respected as a lama. Many have benefited from his profound knowledge, his understanding of Western lifestyle, and his practical wisdom, warmth, and humor.